The brilliance of As a Driven Leaf is the same as its innate flaw: it recreates Elisha ben Avuyah in the image of modern man. This is not the Elisha ben Avuyah whose life is supported by the texts, few of those as there are. This is Elisha ben Avuyah, the conflicted, tortured, modern man, the man of science and reason, the man who is studying Euclid's Elements of Geometry in an attempt to logically dissect and understand Tanakh. Milton Steinberg has done something necessary and beautiful in writing this book- he has allowed modern man to find an ally, someone with whom to share his anguish and pain, someone to whom he can relate. The Elisha ben Avuyah portrayed within the pages of this book is a man of deep feeling, a man who does what he thinks is right or what is best because he firmly believes in his underlying principles. He is not a spiteful creature, cruel and destructive without reason. His actions are understandable; the man himself comes across as extremely human. The Talmud tells that one time Elisha Ben Avuyah entered the Garden of Eden (Paradise). There he saw G-d sitting with Metatron, who as the “Scribe of HaShem” was writing down the merits of the Jewish nation. Elisha Ben Avuyah reasoned that just as one is supposed to stand in the presence of a King, one should also stand in the presence of the Lord, and the fact that Metatron sat with G-d must show that Metatron was His equal. Although G-d struck Metatron with sticks of fire (pulsa denura) to show His sovereignty over the angel, Elisha Ben Avuyah already made up his mind that they are equal. Because of this false premise, Elisha Ben Avuyah turned into an apostate and began preaching heresy. The Jewish Encyclopedia (1901-1906) writes of varying opinions as to what was the forbidden theodology that Elisha Ben Avuyah accepted: He was a Karpotian Gnostic, a follower of the philosopher Philo Judeaus, a Christian, or a Sadducee. A dispute is also recorded amongst sages of the Gaonic Period as to what Elisha Ben Avuyah’s forbidden teachings were. Rabbi Hai Gaon wrote that Acher (Elisha Ben Avuyah’s name given in the Talmud after he became an apostate) succumbed to the Zoroastrian beliefs of the Magi. He believed in dual-deism including a good god, Hormizd, and a god of evil, Ahormin (Ormuzd and Ahriman). Rabbi Saadiah Gaon writes the he believed in a dual-deism of a main god and a secondary, inferior god who ruled alongside each other. We also know more generally that he "was a student of Greek, loved Greek poetry, and apparently had more than a surface knowledge of horses, architecture, and wine. 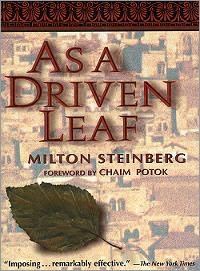 He read forbidden books, which he kept concealed in his clothes" (Chaim Potok in his Foreword to As a Driven Leaf, 8). From this, Milton Steinberg paints a searing portrait of a man as conflicted and confused as any modern man, a person who truly desires to learn and understand and whose intellect leads him to make the choices he does. He treats Elisha ben Avuyah in a sympathetic fashion, allowing his relationship with the whore to actually become a dignified, doomed love for a beautiful courtesan, explaining how it was possible for him to turn against his people, describing the great respect he felt for the Sages even when he was not one of them, suggesting that he was the victim of a loveless, unhappy marriage. He edits and twists the facts to suit his purpose (for example, he neglects to mention the fact that Elisha is survived by two daughters, instead determining that he had no children) and for much of the book, I was concerned that many people would read it and assume that this was true. That was until I encountered a disclaimer, peculiarly positioned at the end of the book rather than the beginning, and heaved a sigh of relief. I would suggest reading the Author's Note before reading the actual book; I assure you that you will feel much better after having done so. As he explains, "In brief, As a Driven Leaf springs from historical data without any effort at rigid conformity or literal confinement to them" (Steinberg 480). Steinberg exercises some really beautiful techniques when writing this book: for example, rather than an actual walk through Pardes upon which Elisha sees Metatron sitting and believes there to be two Gods, he has the four (Ben-Azzai, Ben Zoma, Elisha and Akiva) getting together in a study-group to delve into works of heresy in order to counter them. From there, at different points during the work, each man is positioned in a garden (always a different garden!) and meets his respective fate. It's literary brilliance. Also brilliant is the guilt thrust upon Elisha, whose idea it initially was to have the other three help him with his slipping dedication to religiosity, and who unfortunately ends up dragging the other two down. The book also evokes the spirit of the Talmudic era; I now have a feel for what it would have been like to live during that time period, how the Sages would have interacted, the public lectures they would give and the way their students would treat them. I can imagine all of it, which is excellent, because it gives me a context in which to understand stories in the Gemara. Chaim Potok wrote in his introduction, "I had been studying Talmud from the age of eight, lived deep in its winding argumentations and dialectics. But nothing I ever heard or read before was able to bring the world of the rabbis so vividly to life for me as Milton Steinberg's novel" (Potok 9.) That is high praise. The major difference between the texts and As a Driven Leaf is simply this: as far as I know, Rabbi Elisha ben Avuyah never denied the existence of God. I personally do not know of any place in the Talmud where he makes an outright denial of God. I could be wrong, in which case I would appreciate the correction, but at the moment, I cannot find such a place. He says there are two Gods, perhaps (including Metatron); he says there is no resurrection or reward or punishment (due to the episode with shiluach ha'kan), but does he ever say "There is no God?" No, I don't believe he does. Okay. So where did this misquotation, "There is no Justice and there is no Judge" come from? Why, from the book itself, from As a Driven Leaf. Incidentally, even if the quote does exist, his saying "there is no Judge" does not mean there is no God; it simply means there is no righteous God. God may still exist; He is simply not righteous or just in the eyes of Elisha ben Avuyah. At once Elisha knew the answer to the question he had never ventured to face before. A great negation crystallized in him. The veil of deception dissolved before his eyes. The only belief he still cherished disintegrated as had all the others. The last tenous chord that bound him to his people was severed. And when the sages droned on, their words buzzing like flies, revulsion swept Elisha. He could no longer tolerate their deliberate blindness. In cold desperation he silenced them. "It is all a lie," he said with a terrible quiet in his voice. "There is no reward. There is no Judge. There is no Judgment. For there is no God." The wind blew in from the sea across horror-stricken faces. The sun weltering so long in its own blood, died slowly. This works as long as we are reinterpreting Rabbi Elisha as modern man. And in As a Driven Leaf, we are doing exactly that. In this work, Rabbi Elisha is a mathematical, scientific mind who wishes to prove God's existence and is unable to do it; his doubts are only reinforced by cruel scenarios such as the one where the child dies before his eyes. Hence he becomes an atheist and determines that there is no God. But was Rabbi Elisha this 20th century man? In my opinion, absolutely not. The respect he still holds for the Torah is illogical if he does not believe in God. Most importantly, the answer he gives R' Meir when he is asked why he cannot repent makes no sense if he believes there is no God. Why answer "I have heard the voice behind the curtain saying, "Return o' backsliding children, except for Aher?" The answer would be simple- I will not repent because I am right, and more importantly, there is no God! I have nothing for which to repent and there is no God to listen if I tried!" But that is not the answer he gives. "No," Elisha said wearily, "it's too late. How could I live where I am so hated? I am shut off from returning as though a voice from heaven had proclaimed, 'All may repent, save only Elisha the son of Abuyah!' "
"But, master," meir pleaded, "back there is all that you have failed to find- a faith- a God..."
Steinberg does not grant credence to the notion that Elisha actually heard that voice; he realizes that is ludicrous. After all, if Elisha heard a bat kol then obviously he must believe in God- there is someone calling down from Heaven, after all. So now, it is as though he heard that voice. This is one of Steinberg's greatest departures from the text. 'Up to this point is the Sabbath limit.' He asked, 'Whence do you know?' He answered, 'From the footsteps of my horse which has already traversed two thousand cubits.' Said Meir to him, 'You possess all this wisdom and you will not return?' He responded, "It is not within my power." He asked, "Why?" He answered: "I was riding on my hose, and was passing by the College on a Day of Atonement which fell on a Sabbath, and I heard a voice break forth and say, "Return, O backsliding children (Jer. III, 14). Return unto Me, and I will return unto you (Mal. III, 7) - all except Elisha b. Avuyah, who knew my Power, and yet rebelled against Me!" ...all except Elisha b. Avuyah, who knew my Power, and yet rebelled against Me! Far different from, "There is no God," isn't it? This is not the man "whose struggle to live in two worlds destroyed his chances to live in either" but the deliberate rebel, the man who fought God because he chose to, because he believed him injust, who believed in his existence but still refrained from repentance. Now, of course, I must touch on the pivotal question. Is it true that God forbade Elisha ben Avuyah to return to him? Is that possible? No! And this is what Rabbi Joseph B. Soloveitchik explains in his Five Addresses. The Talmud Babli gives the exact words of the heavenly voice. The Divine Presence roused and drew Elisha b. Abuya to it, but pushed away Aher. Why? Because the true Tanna, the Sage of the Sages of Israel whose Torah Rabbi quotes in the Ethics of the Fathers, never sinned, was never traitorous to Klal Yisrael, never joined the Romans, never sought to tear Jews from Torah and the fear of God. Someone else was the traitor; another personality- Aher. The treachery came about in a strange way. One fine morning Elisha b. Abuya did not recognize himself; he made a disastrous mistake about himself. A gilgul, a dark ugly soul, entered within him, betwitched him and persuaded him that he is not the disciple of the Sages of tradition, that he loathes all that is holy, that Knesset Yisrael is not his mother, that its future is not his future. For a moment Elisha reigned his horse and the heavenly voice reached him "return O backsliding children- except for Aher." The heavenly voice meant for him to throw off the other one, the foreign personality, that he reject his false identity- "Come to me O backsliding child, leave Aher outside!" But a tragic fate caused Elisha to err and instead of hearing "except for Aher", he heard according to the reading of the Yerushalmi his name clearly expressed- "except for Elisha b. Abuya." He thought that he and Aher were one, and that he, Elisha b. Abuya, could not leave Aher behind, alone. He whipped up his horse and was gone, and at that moment the pure personality of the great Tanna was lost, for he no longer recognized himself. Genius with the two different names referring to two different personalities (or two different sides of a personality.) Excellent point and it makes me happy. I love close reading. After some time Elisha b. Abuyah was taken ill, and they came and told R. Meir, "Elisha your master is sick.' He went to him and appealed to him, 'Return in penitence. ' He said to him, "Will they accept me after all this?" He responded, "Is it not written, Thou turnest man to contrition (Ps. XC, 3), even when one's life is crushed. At that, Elisha b. Abuyah burst into tears and died. And R. Meir rejoiced and sai, 'It appears that my master passed away in the midst of repentance. And when they buried him, fire came to consume his grave. They came and told R. Meir, 'The grave of your master is aflame,' and he went and spread his garment over it, and said to him 'TARRY THIS NIGHT in this world which is all night, AND IT SHALL BE IN THE MORNING, IF THE GOOD ONE WILL REDEEM THEE, HE WILL REDEEM THEE [...] and the fire subsided. Is there not a Mishnah to this effect? The case of a scroll may be saved together with the scroll, and the case of phylacteries together with the phylacteries. Elisha will be saved by the merits of his Torah. And so it was that R' Meir succeeded in giving Rabbi Elisha a place in Heaven. As a Driven Leaf portrays an Elisha who is completely and thoroughly broken, who is not even left with the strength of his convictions at the end. It is a moving, shocking, beautiful portrait of the man- one that I will be unable to forget. It portrays R' Meir weeping at his grave in the midst of a storm, having heard that his resting place was struck by lightning; he is a man completely consumed by suffering, unable to argue before God and grant his Master a place in Heaven. The texts are much kinder to Elisha; if he does not repent, it is because of a tragic misunderstanding- if he does, so much the better! No matter the case, R' Meir's love for him will redeem him, and that is the true beauty of the story. R' Meir is willing to share his merit in order to help his Master. But the message that speaks to me- and always has- is R' Meir's. R' Meir fought on behalf of his Master; he did not dismiss him and strove to save him. And he won that battle, was willing to share his merit in order to bring another into Heaven alongside him. I have always thought that that is our true task- that we must amass as much merit as we can, for when we die, we should like to do the same for all the people we love- to bring them into Heaven as well, to allow them entrance to the realm they were compelled to deny. I feel honored to have been quoted. what you're missing is that this book was written by one who can be considered a close talmid of Mordechai Kaplan, and it could be him viewing his "rebbe" Mordechai Kaplan as Acher (and therefore himself as R. Meir). "There is no judgement and there is no judge"
Thanks so much for writing about this remarkable book. I had the pleasure of reading it a few years ago and related very much to the central character. It continues to be an original and important work of historic literature. As a Christian, I'm impressed by this fictional work by Steinberg. It speaks to the very nature of modernism and declares "The only foundation for truth is faith." Reason works from this foundation and cannot be the foundation. Thanks for your extensive and skillful commentary on AADL. I read it years ago, and my copy went missing. Tom'w, after services, I hope to lead an adult discussion on Steinberg, this novel, and his Process Theology (or, at least, his thoughts thereunto).